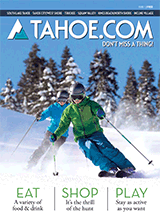 North Lake Tahoe Resort Assoc. Woven into the summer skies that stretch from beaches to pines to lofty meadows is a medley of tunes ranging from reggae and rock to classic and pop. A summerlong lineup of free concerts and big ticket names appearing al fresco as well as in legendary showrooms and intimate pubs. And all accompanied by that class act known as North Lake Tahoe.